On the May 11 and 12, the 8. Dresdener Flächennutzungssymposium (the 8th Symposium of development, monitoring and usages of landuse Dresden) took place in Dresden, Germany. The symposium aims to bring together industry, academy and local government, in order to demonstrate and exchange latest developments in methods, tools and software for the management of landuse data. Further ideas for future applications in environmental monitoring, urban planning and energy consumption when using landuse data are being discussed. The symposium is kept as a tradition and takes place once a year in the hotel of Königshof with luxury decorated salon hall in Dresden. Dr. Hongchao Fan from GIScience Research Group at Heidelberg University was invited to give a talk on the symposium. He firstly presented the quality assessment of building data on OpenStreetMap (OSM) in the area of Heidelberg which has been conducted by comparing OSM data with authoritative data. Then Dr. Fan presented the conceptual framework of intrinsic quality assessment for OSM building data and demonstrated the preliminary experiments and results by using OSM building data in Baden-Württemberg (BW). According to the findings, the buildings are in high completeness in terms of mapping area, while the semantic accuracy is rather low. The positional accuracy and geometrical accuracy are currently evaluated by checking the rectangularity of building footprints and the topologies among buildings, as well as the topologies among buildings and street networks. The current experiments show that the geometric and positional accuracy of building data are quite high. Taking the opportunity, Dr. Fan also appealed to the participants from the authorities for the Open Data issue. Fan, H., Zipf, A., Fu, Q. & Neis, P. (2014): Quality assessment for building footprints data on OpenStreetMap. International Journal of Geographical Information Science (IJGIS). DOI: 10.1080/13658816.2013.867495. Ballatore, A. and Zipf, A. (2015): A Conceptual Quality Framework for Volunteered Geographic Information. 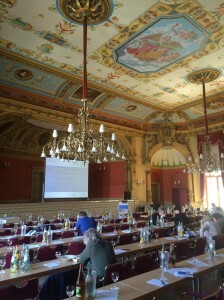 COSIT - CONFERENCE ON SPATIAL INFORMATION THEORY XII. October 12-16, 2015. Santa Fe, New Mexico, USA. Lecture Notes in Computer Science. Yang, A., H. Fan, N. Jing, Y. Sun, A. Zipf (2016): Temporal Analysis on Contribution Inequality in OpenStreetMap: A Comparative Study for Four Countries. ISPRS International Journal of Geo-Information. 5(1), 5. Jokar Arsanjani, J., Mooney, P., Zipf, A., Schauss, A., (2015): Quality assessment of the contributed land use information from OpenStreetMap versus authoritative datasets. In: Jokar Arsanjani, J., Zipf, A., Mooney, P., Helbich, M., (eds) OpenStreetMap in GIScience: experiences, research, applications. ISBN:978-3-319-14279-1, Springer Press. Barron, C., Neis, P. & Zipf, A. (2013): A Comprehensive Framework for Intrinsic OpenStreetMap Quality Analysis. Transactions in GIS, DOI: 10.1111/tgis.12073. Goetz, M. & Zipf, A. (2013): The Evolution of Geo-Crowdsourcing: Bringing Volunteered Geographic Information to the Third Dimension. In: Sui, D.Z., Elwood, S. & Goodchild, M.F. (eds. ): Crowdsourcing Geographic Knowledge. Volunteered Geographic Information (VGI) in Theory and Practice. Berlin: Springer. 2013, XII, 396 p.
Jokar Arsanjani, J., Mooney, P., Helbich, M., Zipf, A., (2015): An exploration of future patterns of the contributions to OpenStreetMap and development of a Contribution Index, Transactions in GIS, volume and issue pending, pp. pending. John Wiley & Sons. DOI: 10.1111/tgis.12139. Bakillah, M., Liang, S. H. L., Mobasheri, A., Jokar Arsanjani, J. & Zipf, A. (2014): Fine resolution population mapping using OpenStreetMap points-of-interest. International Journal of Geographical Information Science (IJGIS). Taylor & Francis.